Late last night, we had our first print on the big robot. 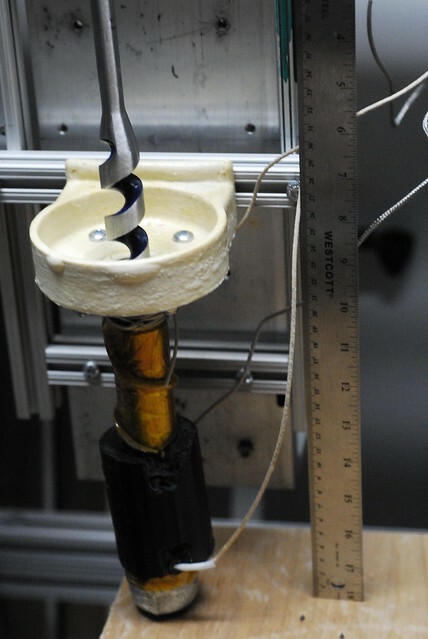 This robot eats chipped HDPE milk jugs (the plastic ones, clear and opaque both) and extrudes them a lot like a big RepRap. We’ve been working on it for a few months now. The nucleus of the machine is a CNC router table, a DynaCNC 1000. The company is out of business, as you might notice from the website, but they were located in Monroe, Wash. The CNC table is controlled by a piece of software called Mach3, which is a more or less generic robot control software thing. It’s got a million or so knobs. Kind of like Skeinforge but these buttons move the actual robot. The DynaCNC folks wrote some custom VBscript code to tell Mach3 how to talk to their special hardware. We built an extruder head and mounted it in place of the router that the table came with. It’s a simple design, mostly just a scaled-up version of a standard RepRap print head. The major parts came from Home Depot: about 1 foot length of 1” (inside diameter) steel pipe threaded on both ends, a round-end pipe cap, and a pipe-end-to-flat-surface adapter. Inside the black cylinder is a length of heater cord wound tightly around the pipe; you can see it spiraling out to give the top of the barrel a bit of a thermal gradient. The black cylinder is a bit of aluminum tubing from a projector mount that we had lying around, filled with fire cement. There’s a thermistor in there too. This extruder has a lot of thermal mass. It takes about an hour to heat up to the 180-190 Celsius we print at. The adapter bracket thing is bolted to a custom-cast part. We plaster printed an original, made a silicone negative, and cast a positive with Smooth-On TASK 8. We cast some long bolts right into the part so we wouldn’t have to worry about them coming loose. The extruder is mounted on a frame which then bolts to the robot head, so that we can remove it in one piece as necessary. This way we can reattach the original cutting head. To drive plastic into and through the head, we got an augur from Home Depot and chucked it into a Harbor Freight 1hp drill which is bolted to the frame. This drill is powered through the spindle relay on the router table, so it’s under software control. We can’t make it go backwards, but I don’t think anti-ooze retraction would be very useful on a head this big! 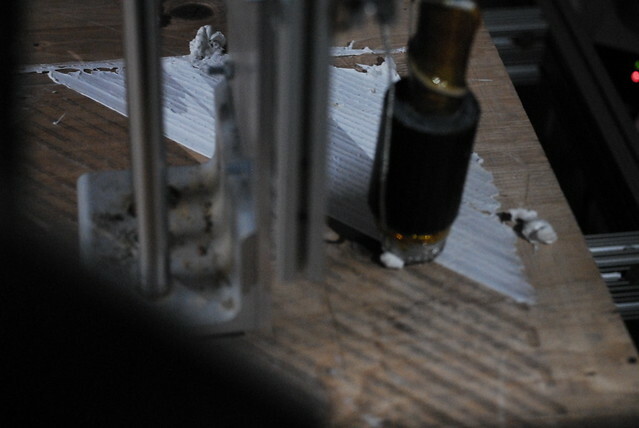 The nozzle is 6mm across but the extruded material is about 8-10mm thick due to relaxation. We were running the head across the bed at about 1 centimeter/second, which looks like it may be too fast for stacked layers. To get that wonderful blend of chipped HDPE you see on the right, we sliced and shredded a bunch of (cleaned) plastic milk jugs. 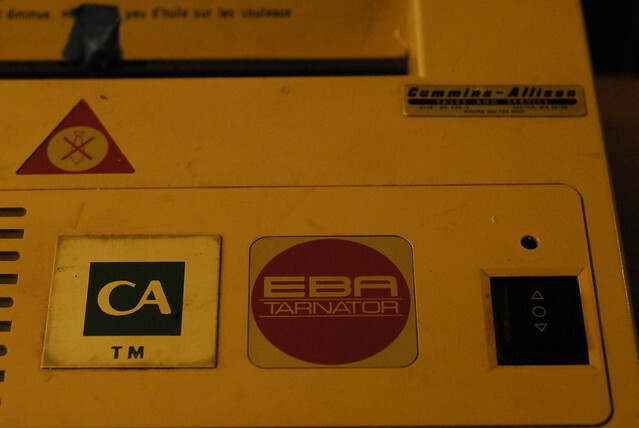 The shredder, named TARNATOR by its manufacturer, is a West German model that is more than happy to eat most anything. It will eat a milk jug that’s been sliced open. With a little persuasion, it even chunks right through the screw threads on the top. 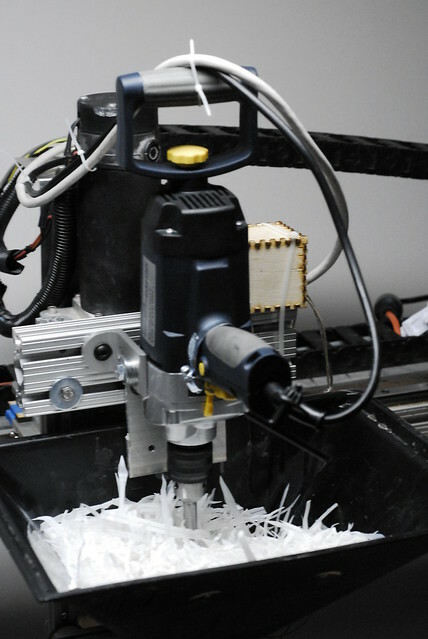 TARNATOR gives us ribbons of HDPE about 4mm across (3.8mm according to the nameplate), which we then shred a second time to get chips. We’re investigating using a blender to chip the ribbons instead. The augur chip feed needs babysitting to prevent it starving, even when the hopper is full. Unexpectedly, the drill makes angry stressed robot sounds when it’s nice and full, and happy unloaded motor sounds when the augur isn’t feeding well. We also had some problems with the temperature dropping below the melting point last night, which made the motor singularly angry. The whole purpose of this exercise is to print a boat. What should we make next? Comment below if you have an awesome idea!